This city is both poly-centric and a linear city. 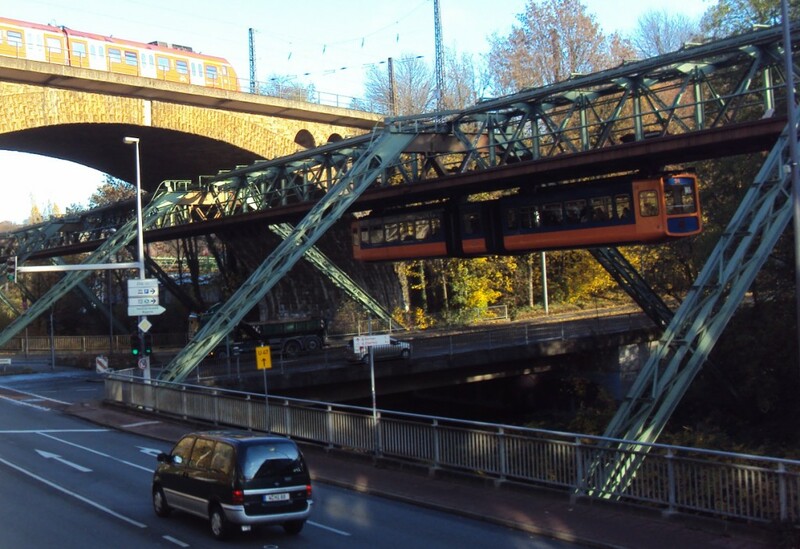 Along its axis is the 13km-long suspension railway (Schwebebahn), with around 65,000 passengers each day using its 20 stations. Alongside this is the heavy rail line with 400 train journeys daily through 9 stations, and below these is the B7 German federal highway. Crossing all of them is the Sonnborner cross-motorway junction, which at the time of its opening in 1974 was considered the largest inner-city motorway intersection in Europe. This place is very well connected. The city is said to have no clear centre. It has two major urban centres (Elberfeld and Barmen) and five other districts, which are predominantly small towns with their own centres. 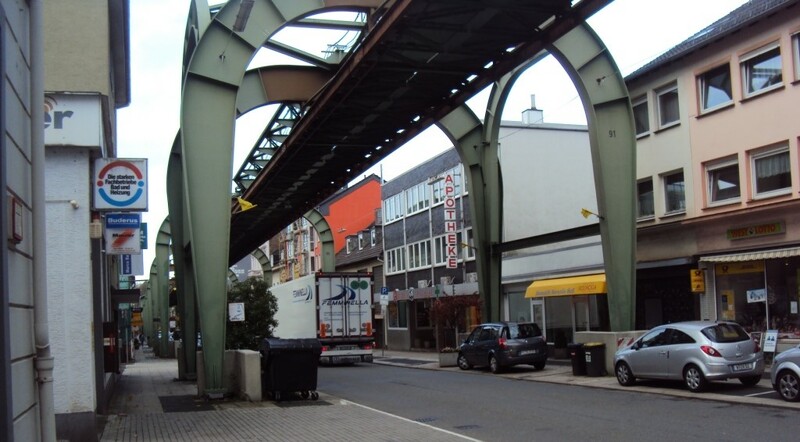 The city of Wuppertal was not actually governed by a single city council until 1929, when 5 smaller cities united, then in 1975 it divided into 9 municipalities or boroughs, which are further divided into 69 districts for statistical purposes. (Hamilton is divided into 44 areas by Census NZ). A bit of history on the cities of Elberfeld and Barmen, which together boasted 189,489 inhabitants in 1880, then the conurbation was regarded as the sixth largest city in the German Empire after Berlin, Hamburg, Breslau, Munich and Dresden. 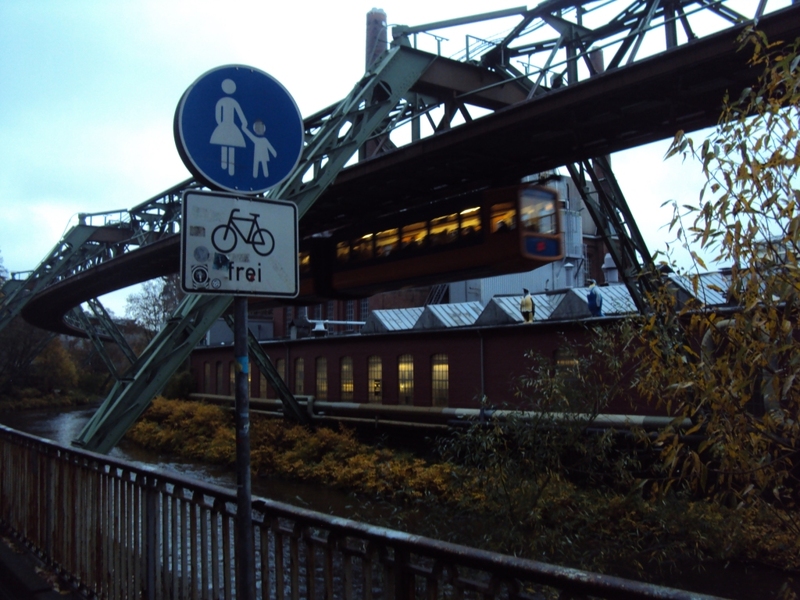 Cologne (144,772 inhabitants), Dusseldorf (95,458) and all cities of the Ruhr were well down in the bottom rankings. From 1874 a horse tramway served the local traffic needs of the valley. But the local traffic problems continued to increase. In June 1903, the suspension railway opened. Bench-mark this against the world’s first electric elevated railway, which started in 1893 in Chicago when its population was over 1 million; in 2012, the average number of weekday boardings on the Chicago Green Line was 70,554. 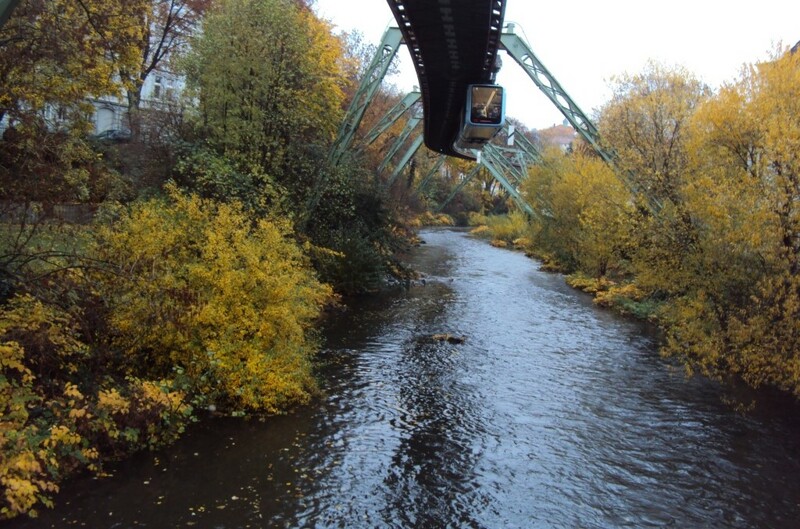 The Chicago model was proposed for partner towns along the Wupper River, but there were protests from the horse tramway company and a public discussion on the possible disfigurement of the cityscape, so the Schwebebahn was built. In Thomas More’s Utopia, ‘their houses are three storeys high’. 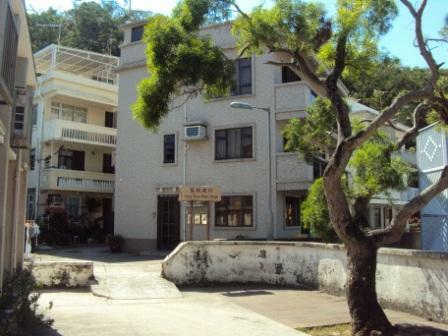 The town of Yung Shue Wan, on Lamma Island, Hong Kong, allows ‘a maximum building height of 3 storeys (9m)’. The town has a population of approximately 6,000 people, living in an area of something like 8 ha (0.08 km2), which gives it a population density of around 7,500 people per km2. The Hamilton district plan allows a 10m build height throughout the city, and our population density is about 1,500 people per km2. So based on no change to the build height, the Hamilton population could increase 2 to 3 times without needing to open up more land on its edges for housing. Hamilton could have a population of close to half a million, without change to existing height limits. The fact that Hong Kong has the world’s seventh highest life expectancy (New Zealand is 17th) suggests that living in higher density places maybe good for us. Height limits are important in keeping a city to a human scale. Hong Kong’s cities are big, but Lamma Island allows trees to have an equal place in the landscape. Also, the protection of the green belt plays a major role in keeping the city liveable. On Lamma Island over 330 hectares are zoned as Green Belt. I’ll let notes from their zoning plan (no. s/i-li/9 page 54) explain. What also keeps the island peaceful is that the main method of getting around is on foot or by bicycle (there are no cars). This makes visiting here very pleasant, especially coming from the busy streets of Hong Kong Island and the drive to Auckland.